I must really love punishment, because here I am again fixing another EM pinball machine. I can’t help it though, their tendency for faults aside, EM’s are beautiful machines and every line up should contain at least one. This time I’m looking at another baseball themed machine by Gottlieb, appropriately (maybe boringly?) named “Baseball”. It was released in 1970 with around 2350 units shipped. It came out about a year before Playball (which I fixed up recently) and both machines share a very similar playfield layout and feature set. 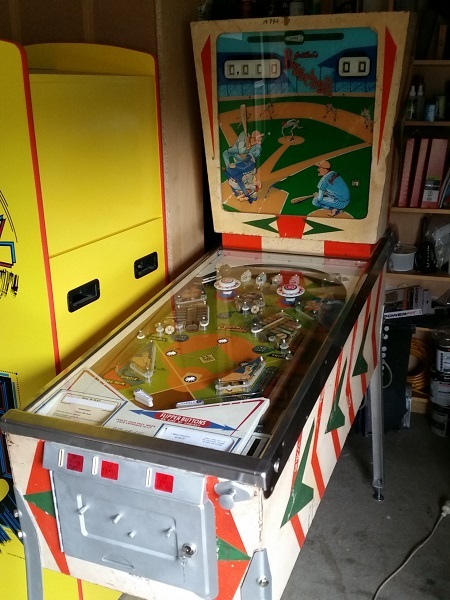 This isn’t my machine and I’m simply repairing it for someone else (the same guy owns the Playball I fixed up and documented recently). It’s not a restoration, just a fix up for the issues it’s having.